The rationale for our initiative derives from the clear comprehension that the social struggle in the era of neoliberal globalization can no longer be just a struggle for social liberation, as obsolete Marxists still believe today and some Trotskyites have always believed. This becomes obvious when one considers the fact that, as soon as a country (not belonging to the Transnational Elite, i.e. mainly the “G7”) is integrated into the New World Order (NWO) of neoliberal globalization, it loses every trace of economic and, consequently, national sovereignty, either because it has to obey the EU rules (in Europe) or the WTO and IMF rules (in the rest of the world), as well as the orders given by capitalist lenders, bankers and the TNC’s executives, of course. This is why the struggle for social liberation today is inconceivable unless it has already gone through national liberation. The occupying troops that are now destroying and ‘plundering’ countries like Greece, Portugal, Spain, Argentina etc, as well as the weakest social strata in all countries, even the most economically advanced ones (with the full cooperation of small, local privileged elites which control the media, the political parties, the “Left” intelligentsia etc. ), are not a regular army in uniform with lethal weapons of physical violence at their disposal. The occupying army today is an economic army in suits, possessing equally lethal instruments of economic violence, as well as the means (the mass media and social media, NGOs etc) to justify it. So, at this crucial historical juncture that will determine whether we shall all become subservient to neoliberal globalization and the transnational elite (as e.g. the DIEM25 Manifesto implies through our subordination to the EU) or not, it is imperative that we create a Popular Front in each country which will include all the victims of globalization among the popular strata, regardless of their current political affiliations. In Europe, in particular, where the popular strata are facing economic disaster, what is needed urgently is not an “antifascist” Front within the EU, as proposed by the ‘parliamentary juntas’ in power and the Euro-elites, also supported by the globalist “Left” (such as Diem25, Plan B in Europe, Die Linke, the Socialist Workers’ Party in the UK, SYRIZA in Greece and so on), which would, in fact, unite aggressors and victims. An ‘antifascist’ front would simply disorient the masses and make them incapable of facing the real fascism being imposed on them by the political and economic elites, which constitute the transnational and local elites. In fact these pseudo-anti fascist fronts, along with the protection of “Human Rights”, which never target the ultimate cause of every sort of repression, –that today is the New World Order–, are used as tools of the EU’s (and the entire Transnational Elite’s) propaganda to smash any anti-NWO movement and particularly those coming from the antisystemic Left, like the Inclusive Democracy movement. Instead, what is needed is a Popular Front that could attract the vast majority of the people, i.e. the victims of globalization, who would fight for immediate unilateral withdrawal from the EU – which is managed by the European part of the transnational elite – as well as for economic self-reliance, thus breaking with globalization. 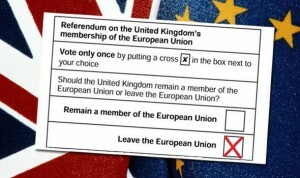 In our view, it is only the creation of broad anti-EU Popular Fronts that could effect each country’s exit from the EU, with the aim of achieving economic self-reliance. Re-development based on self-reliance is the only way in which peoples breaking away from globalization and its institutions (like the EU) could rebuild their productive structures which have been dismantled by globalization. This could also, objectively lay the ground for future systemic change, decided upon democratically by the peoples themselves. 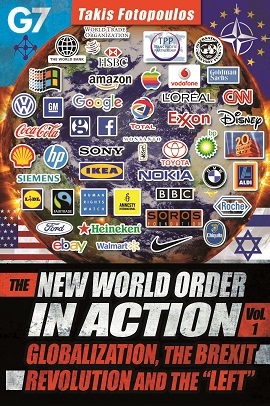 To expect that the globalization process will itself create the objective and subjective conditions for a socialist transformation, as some ‘Paleolithic Marxists’ believe, or alternatively, that the creation of self-managed factories within the present globalized system will lead to a self-managed economy, as a variety of life-style “anarchists” suggest, is, in effect, to connive at the completion of the globalization process, as planned by the elites. Even worse, to expect that within the NWO institutions, like the EU, a ‘good’ EU and consequently a ‘good’ capitalist globalization will emerge at the end, as DIEM25, SYRIZA, Podemos and the like suggest, amounts to the pure disorientation of peoples which allows the plan for global governance to be fully implemented. Self-reliance here is meant in terms of autonomy, rather than in terms of self-sufficiency, which, under today’s conditions, is neither feasible nor desirable. A useful definition of self-reliance is the one given by the 1974 Cocoyoc Declaration of non-aligned countries as “reliance primarily on one’s own resources, human and natural, and the capacity of autonomous goal-setting and decision-making”. Thus, although self-reliance implies maximal utilisation of local resources and sources of energy, it should not be confused with autarchy and should always be seen as a necessary condition for autonomy in the sense here of political and economic sovereignty. Needless to add that self-reliance in this sense is impossible within the World Trade Organization framework and the limited degree of import substitution allowed by its rules, whereas it is perfectly feasible e.g. within a Eurasian Union , provided it develops into a political and economic union of sovereign nations, as it was originally designed. In other words, the fundamental aim of the social struggle today should be a complete break with the present NWO and the building of a new global democratic community, in which economic and national sovereignty have been restored, so that peoples could then fight for the ideal society, as they see it. The conditions of occupation we live under today mean that people resisting it have to make broad political alliances with everyone concerned who accepts the aims of a Popular Front for National and Social Liberation, particularly the basic aim of breaking with the NWO. Then, once the people of a particular country have broken with the NWO, they need to join with peoples from other countries who have already achieved their economic and national sovereignty and, together, form new economic unions of sovereign states to sort out, between them and on a bilateral or multilateral basis, the economic problems arising from trade and investment. Then and only then, the crucial issues of the form that a future society should take, and the strategy needed to achieve it, could be raised. Therefore, the vital issue today, in the fight for the creation of a new democratic world order, is how we create this alternative pole of sovereign self-reliant nations, in full knowledge that the TE will use any kind of economic or physical violence at its disposal to abort any such effort, with all the huge means available to it. The current struggle of the British people to break with the EU and the massive attack launched against it by the TE and its economic and political organs in Britain (Labor Party, British “Left” , The Guardian etc) is a clear example of the magnitude of the struggle we face. To our mind, under conditions of effective occupation, as many describe the present situation, this is impossible today without the creation of a Popular Front for National and Social Liberation (FNSL) in each country, allowing peoples to achieve their economic and national sovereignty as a precondition for social liberation. The social subject of a mass popular front pursuing the aims we described above would be all the victims of neoliberal globalization: the unemployed and the partially employed, wage-earners on the very edge of survival (zero-hour contracts, occasional workers etc. ), children without education who are ‘punished’ for being ‘unlucky’ enough to be born to non-“privileged” parents, as well as all those at the subsistence level (pensioners, the sick who lack medical insurance ― amounting to one third of the population today ― and others). As far as the political subject is concerned, there are two possible options concerning the required Front for National and Social Liberation (FNSL): a front ‘from below’ or a front ‘from above’. The preferred option is of course the former, but in case this becomes unfeasible because the level of political consciousness of the victims of globalization and their will to fight is inadequate for this huge task, then the only other possibility is for existing political forces to take over the task of achieving sovereignty and self-reliance. A FNSL ‘from below’ could be organized from among local assemblies, committees, groups and initiatives consisting of the victims of globalization (namely, the vast majority of the world’s population) who ought to join as ordinary citizens, irrespective of party affiliations and ideologies or religious and other differences, as long as they share the ultimate aim of national and economic sovereignty. The intermediate target should be the exit from the international institutions of the NWO like the EU, so that the victims of globalization could escape the present process of economic catastrophe. Then, once the people of a particular country have broken with this criminal “Order”, they should join with peoples from other countries, also fighting for the same aims, to form new political and economic unions of sovereign Nations and the corresponding democratically-organized international institutions together, within a new international community of self-reliant nations based on the principle of mutual aid rather than competitiveness ― the guiding principle behind the present criminal NWO. As long as the member countries share complementary production structures, the possibility of an involuntary transfer of economic surplus from some countries (usually the weaker ones, as is the case in the EU) to other countries in the Union can be ruled out. Therefore, a collective kind of self-reliance could be achieved within the economic area covered by such a union, which should be based on the sovereignty of each participating country. In other words, a FNSL would function as a catalyst for fundamental political and economic change, which is the only kind of change that could get us out of the current mire, while also revealing the attempted deception by the globalist “Left”, according to which we could somehow emerge from this catastrophe even without leaving the EU —as the globalist “Left” deceptively preaches. Briefly, we may distinguish three main stages through which the liberation process could go through, following the taking over of power by Popular Front governments. Further aims and the ways to be achieved will be decided by the FNSL assemblies, and coordinated by their delegated Coordinator Assembly. e) Re-designing of the public sector including a socialized health service, public education service, social insurance and the industries covering social needs (banking, energy, transport, communication and so on). In all these sectors private business activity will be ruled out and social services will be controlled by the assemblies of workers in those sectors under the guidance of the Popular Front Government. f) Guaranteeing full employment for all citizens as well as a minimum income for all (covering at least the survival needs for food, clothing, housing etc.) through heavy progressive taxation on the privileged social groups (following a proper census of all their wealth and incomes, including deposits abroad); such measures will also finance the Popular Front’s government social policies. g) Finally, a necessary condition for the implementation of all these measures in the short-term, as well as of the measures described below to be taken in the medium and long term, is the radical change of geopolitical relations, so that the “Libyan” or “Ukrainian” examples are not repeated in the countries moving away from the EU and the NWO in general. This presupposes the creation of an international front of all countries presently resisting the NWO, from Venezuela, Bolivia and Cuba up to the countries in the EU periphery that will break with the EU, the peoples in the Middle East (Syria, Iran), as well as the peoples in the broader Eurasian area, and particularly the Russian people who presently, from communists up to nationalists, are united against the NWO. Given the aggressiveness of the TE against Russia we believe it is a matter of time before the globalists within the Russian elite (which control even RT) are set aside and the Russian people leads a new world liberation struggle against the NWO of neoliberal globalization towards the creation of a new world democratic community based on sovereign and self-reliant nations. The alternative would be the creation of a new subordinate member of the TE, as the globalists within the Russian elite aim. Developing a mixed system of ownership of the means of production, ranging from small private ownership (e.g. farming, services) to various forms of collective ownership (from socialized industries e.g. in energy, communication, transport to co-ops etc.) and demotic enterprises in which the people running them will be the workers employed by them, under the guidance of the demotic assemblies, i.e. the citizens’ assemblies in the municipalities where the enterprises are based; * and, finally. Establishing a new mixed system of allocation of resources for this transitional stage, which will consist of indicative planning, economic democracy and the market. In this way, the second stage will prepare the ground for the transition to the third stage, at which the crucial decision on the form of the systemic change will be taken democratically by the citizen’s assemblies. Such assemblies could well take the form of a Constitutional Assembly that would determine each country’s constitution accordingly. In other words, it is at this stage that citizens will decide democratically the form of self-government they prefer for the future. It is hoped that by this stage, both the objective and subjective conditions for systemic change would have been created. Thus, as far as the objective conditions is concerned (e.g. self-reliance), it is assumed that by that stage these conditions would have already been achieved anyway, so that the new system could function properly. As far as the subjective conditions is concerned, as the decision to be taken would be a fully informed citizens’ decision on the form of society they want, it has to be based on their own experiences of the various forms of economic self-management. One could reasonably expect that the subjective conditions would have fully been developed by that time for a considered decision to be taken on the matter, rather than one on the basis of the media’s brain washing, as used to be the practice in the past.